creative savv: What's on your Thanksgiving menu? So, we just assume that everyone has turkey, yams and pumpkin pie, for Thanksgiving. But the truth is, each family is different, and feast favorites vary from region to region. My brother doesn't eat turkey, so for the last 15 years, his wife has been making Beef Wellington for Thanksgiving. I'd never eaten green bean casserole, until I was an adult. Now it's a favorite of my kids, and I couldn't skip it if I wanted to. A good friend comes from the South, and sweet potato pie is favored over pumpkin pie. So, what's on your menu for tomorrow, and when do you eat your big meal? Our friends will be arriving around 3:30. We'll enjoy some time over appetizers and cider, then have dinner around 4:30. And one other detail, we'll be listening to Christmas music. Does listening to Christmas music and having Christmas decorations up on Thanksgiving sound wrong to anyone? Now I've got to get into the kitchen. So much to do, so little time! your table looks absolutely wonderful. And I love the pumpkin arrangement too. Wishing you and your family a truly lovely Thanksgiving celebration. What a beautiful table! And a mouth watering menu! Well, I have never actually bought or roasted a turkey. 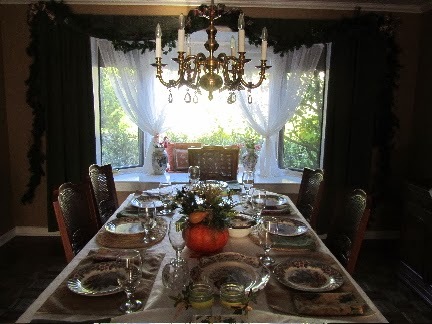 We have always gone to my Grandparents' home for Thanksgiving dinner. My Grandma roasts the turkey each year. Tomorrow, my husband, two sons and I will once again go to their home. Only this year, my precious Grandpa will be absent from the table. He had a brief battle with cancer starting around February and went home to be with the Lord in May. He was 91. We all miss him so much. I always contribute the same dishes to the meal: cornbread casserole, sweet potato casserole, two pumpkin pies and whipped cream. Sometimes I also make a green bean casserole, but decided not to this year. In addition to roasting the turkey, my Grandma also makes the stuffing, mashed potatoes/gravy and has green beans and corn (preserved from her garden). My Mom and Dad always bring a ham, yeast rolls, cranberry relish and 'Baco Salad'. A lot of people haven't heard of that salad but it's never absent from our Holiday meals. My Mom found the recipe in a magazine back in the 1970's or 1980's. It's iceberg lettuce, red onion, a bag of frozen peas (uncooked), a bag of shredded cheese and 'Baco' bacon bits. My Mom cooks a pound of bacon though and crumbles it in the salad instead of the Baco bits. We think it tastes better that way. I think the original recipe also called for celery, but we don't care for it in the salad. The dressing is Miracle Whip and sugar. It's an odd Thanksgiving tradition, but we like it. The other dishes brought by other relatives seem to vary. They like to be adventurous and try new dishes every year and that makes it exciting! We always have an abundance of food, family and fellowship. your Thanksgiving sounds like it will be lovely. Although I can understand feeling like there's one empty chair, this year. I'm sorry to hear you lost your grandpa this past year. Your baco salad sounds a lot like a 7-layered salad that I make from time to time, layers of lettuce, frozen peas, grated cheese, onions, chopped boiled eggs, bacon bits and then covered completely with a mayo dressing, almost like it's frosted. It keeps up to 2 days in the fridge and is a great make-ahead salad. I think it was a 70s salad. My mom used to make it when I was growing up. Let me be the third to tell you what a lovely and elegant table you have! Have a wonderful Thanksgiving! Enjoy your family and friends. Your feasting sounds delicious! I've heard of oysters in the dressing, but never clams before. Interesting! I've been getting out the Christmas decorations just a little at a time. It began when something was in my way, in a closet. So, instead of just move it, I went ahead and set it out. And it snowballed from there! Have a lovely Thanksgiving and early Christmas, with your family! So much to be thankful this year! Yes, every family does have it's traditions. One time I had Thanksgiving dinner with my brother-in-law's family where mashed turnips are a must. However, I didn't know that. Imagine my disappointment when I thought I was getting mashed potatoes but got turnips instead. Luckily, there was plenty of gravy. Your comment about the turnips made me smile!! Mashed potatoes and mashed turnips might looks a whole lot alike, but the flavor is very different! It sounds like you were good guest and tried to eat them anyway!! Thanksgiving is always an interesting meal with my family. We've got all of my food allergies to contend with, and my cousin (not really my cousin - she's my parents' god-daughter, but we were pretty much raised as cousins) anyhow, she's gluten and lactose intolerant, and then there's my dad who hates turkey, stuffing, sweet potatoes and mashed potatoes. My poor step-mom... I fear we're a real challenge for her when it comes to meal preparations! This year it's Cornish game hens with a big variety of side dishes - hopefully enough so that everyone will find something they can eat! I hope you have a fabulous day with your family, and speaking as one who LOVES Christmas carols, I don't think it's ever too early! Well, yes, the table has been set for a couple of days. It's one of the few things that I can do well ahead of time, saving my energy for cooking the day of. I have a good friend whose husband can't stand the traditional turkey dinner, either (like your dad). So they do something like a Mexican dinner, each year. It seems to work for them. I'd like to do something like that, but I'd have a mutiny on my hands, if I did!